The Vancouver Condo Buzz » Morningstar Homes Presents the Luxury Abbotsford Pepin Brook Vineyard Estates Community – Beautiful & Affordable Abbotsford Homes for Sale (3200 to 3600 sf) on 29 Acre Winery! « The Rolston Is Now Here! 23 Storeys of Landmark Architectural Design is Coming to the Downtown Vancouver Real Estate Market! Morningstar Homes Presents the Luxury Abbotsford Pepin Brook Vineyard Estates Community – Beautiful & Affordable Abbotsford Homes for Sale (3200 to 3600 sf) on 29 Acre Winery! A truly unique and exciting new Abbotsford real estate development is taking shape at the Pepin Brook Estate Winery. Built by Mornginstar Homes, these prestigious new Abbotsford homes for sale provide many amenities, including its own winery! A collection of spacious single family homes are now selling at the grand opening of the new Abbotsford Pepin Brook Vineyard Estates with a release of one hundred and fifty residences for sale. Located in an award winning Fraser Valley vineyard, the presale Pepin Brook Abbotsford homes present 3 and 4 bedroom floor plans that are very large, most of which range from 3220 to over 3600 square feet in size on large lots. 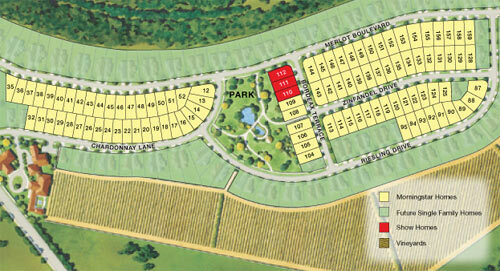 Not only that, but the price point for these new Abbotsford Pepin Brook Vineyard Estates is absolutely amazing, with homes starting from the high four hundred thousand dollar range ($400,000 range), making them the most affordable new Abbotsford real estate development available in the market place today! Expansive floor plans coupled with detailed craftsmanship are seen throughout the community, as Morningstar Homes has priced the Pepin Brook single family homes more than $150,000 lower than a comparable home in the neighbourhood. Not only that, but there are tonnes of amenities in this neighbourhood that include a three acre park, sports courts, schools and shopping/dining options nearby. The new Abbotsford homes for sale at Pepin Brook Vineyard Estates are also built by award winning and well experienced developers at Morningstar Homes so that you are ensured a finely crafted and well built home that will last for generations. Just launched, many homebuyers have already been through the display home, with many homes being sold already. The combination of full ownership Abbotsford homes for sale coupled with a winery is the first in all of British Columbia and is very exciting for many new home purchasers. The sales centre set up by Morningstar Homes for the Pepin Brook Abbotsford estates is located at 29363 Bordeaux Terrace, Abbotsford and is open daily from 12 to 6pm except Fridays. Recently in mid-March 2010, the new Morningstar Homes Pepin Brook Vineyard Estates were featured with a great article piece. In a nutshell, the new Abbotsford Pepin Brook homes for sale is a new community of single family houses located on a vineyard in the Fraser Valley. The project location is actually in Bradner, just west of Abbotsford, and the offering includes 150 full ownership detached family homes that are all over 3000 square feet in size with unfinished basements. Occupancy for these new Pepin Brook Abbotsford homes for sale by Morningstar are set for mid April 2010 and the sales centre is now open at 29375 Boradeaux Terrace off the Fraser Highway (west) and Ross Road. The building designer for these Fraser Valley vineyard estates at Pepin Brook Abbotsford is by Fred Sale and Associates while The Creative DesignWorks Inc designed the interiors of these traditional yet modern homes. The pricing starts from $499,900 and these truly affordable Abbotsford homes for sale are family oriented. True value is seen here and the community is very close to Aldergrove, Langley, Clearbrook and downtown Abbotsford. There are now three show homes available for previewing on site and many of the Pepin Brook Abbotsford estate homes feature great rooms with double height ceilings (with lots of windows). Also, the homes feature ground level entrance, secondy storey master bedrooms and the finest finishes you will see. True craftsman style architecture by Morningstar Homes gives the single family Abbotsford home community of the Pepin Brook Estates character and timeless design. Also, all homes are built according to Morningstar’s GreenStar standards and includes such finishes as moderate interior termperatures that are moderated by Low-E windows, power vented hot water heaters, low flush toilets, low VOC paints and much more. These certified Abbotsford green homes at the Morningstar Pepin Brook Vineyard Estates are affordable, well located spacious and functional for families. 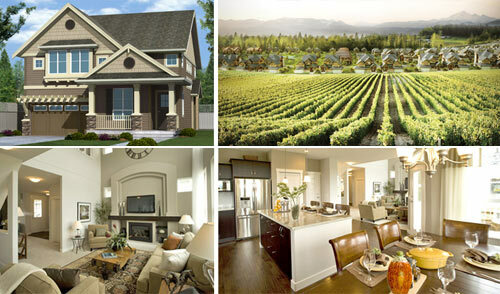 Morningstar Homes real estate developers is now launching the presales for Pepin Brook Vineyard Estates in Abbotsford. These three and four bedroom single family vineyard homes at Pepin Brook Abbotsford real estate development add an exciting new component to this master planned neighbourhood by Morningstar Homes and will be affordably priced in the high four hundred thousand dollar range. This indicates that the selling price is significantly less than the $635,000 average home price for similar new homes in Abbotsford real estate market at this time! The Pepin Brook Estates Abbotsford vineyard homes floor plans range from 3228 to 3580 square feet and here’s an interesting incentives: This 100 acre master planned Abbotsford single family home community sits on a 29 acre winery so homeowners will have a veinyard right at the Pepin Brook estate Winery right in their backyards! You can read more about the presale Abbotsford Pepin Brook Estate Vineyard Homes for sale on the Morningstar Homes website at www.morningstarhomes.bc.ca. Beat the HST at Pepin Brook Vineyard Estates in Abbotsford! Phase 2 is now 40% SOLD OUT! 7 New Abbotsford Homes to be completed before HST! Starting at $649,000! Located on a beautiful 7212 Sq Ft lot, we have a 2 storey Pepin Brook Vineyard Estates Abbotsford home with an unfinished basement. 2650 Sq Ft Finished, 4 bedrooms upstairs, this is a great family home! For the month of April, 6 appliances, Front & Rear Landscaping to be included. This is an amazing Pepin Brook Vineyard Estate Abbotsford home for sale with 3 levels. The basement is a spacious unfinished space of 1289 square feet that can accommodate a bedroom, bathroom (full) and two recreation rooms. The main floor of 1293 sqft features a huge kitchen, dining room, great room with fireplace, study, laundry room, foyer and double attached garage (side by side). In addition, this new Abbotsford home for sale at Pepin Brook Vineyard Estate features an upper floor of 1390 square feet that includes the master bedroom and ensuite bathroom with corner soaker tub, double vanities, separate walk in shower and walk in robe. In addition, there are three other bedrooms (one with a sitting room) in addition to two more bathrooms and a loft gallery space on the upper floor. The new Abbotsford Pepin Brook Estates are brought to you by Azura Management Corp and the presentation centre is located at 2368 Chardonnay Lane, Abbotsford.